Although lice infestation is very common, especially among small children who go to daycare, kindergarten or school, almost no one likes to talk about it. Even nowadays, when there are countless means to prevent and treat lice, this subject is avoided mainly because it is considered to be embarrassing. Yes, health taboos still exist! But here, we’ll get over them. So, let’s talk about lice and how they affect your child! A few days ago, our 2.7yo daughter came home from daycare with lice. Initially, we got a bit scared because we didn’t know how to manage the situation. This was a first for us. But, after we calmed down, we talked about it openly, we read multiple articles, studies and product reviews, we looked for advice from a pediatrician and we reached a conclusion: the situation wasn’t at all as bad as it seemed. In order to prevent lice or detect the early signs and symptoms, you should be open minded, leave the embarrassment behind and get well informed about the matter. Remember, it can happen to any of us, no matter how clean or careful we think we are! How we found out? We noticed our daughter waking up during the night. Nervously, she started to scratch and rub the back of her head. 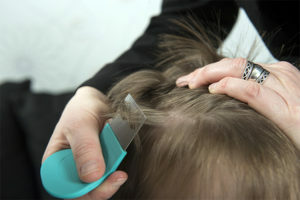 The iching is the he most common early sign of lice on your toddler’s head (caused by the lice’s movement or the allergic reaction to lice bites). If you see your toddler scratching his head (especially in the back of the head or ears), take immediate action and check out his scalp and hair. Trouble sleeping – It is known that lice are more active in the dark. Rashes or sores on the scalp caused by irritation or allergy. Spotting a live louse or nymph on your toddler’s scalp. Spotting nits (“eggs”) on your toddler’s hair. Chemical treatments or lice-killing treatments over the counter, like Nix Lice Treatment or RID Shampoo. These treatments are effective, but they usually contain neurotoxins as pyrethrins, permethrin or malathion which are also used in garden pesticides. These kind of treatments are not recommended for small children. Natural shampoo or spray, pesticide free, made entirely from natural ingredients, such as: Head Hunters Naturals Wipeout Professional Lice Treatment or Meticulice Head Lice Professional Treatment Removall. Wet-combing with a special comb which has long, fine, metal teeth that are very close together. Electronic combs which emit a small electrical charge that isn’t sensed by humans, but is lethal to the lice. Lice are destroyed as soon as they come into contact with the comb teeth. Electronic combs are chemical free. Prevention treatment – refers to lice repellents (usually sprays) such as: CleaNit Lice Repellent Spray Repel and Prevention or Fairy Tales Rosemary Repel Leave in Conditioning Spray. Notify your child’s daycare or kindergarten. Check your whole family members for lice. Apply the treatment to everyone in your household at the same time. Sanitize your house: clothes, bed sheets, pillows, carpets, stuffed toys etc. (lice cannot jump or fly, they cannot live on pets and can’t survive more than 24 hours off the host, but there are chances you’ll get them again from your bed, couch or other house items if the place is not properly sanitized.). Wash everything in hot water (+60 degrees) and use anti lice products for your home. A very effective and also organic, natural and non-toxic product is Eco Defense Lice Treatment For Home, Bedding, Belongings and more. How we got rid of our toddler daughter’s lice and nits in just 2 days? We wet our little daughter’s hair with a spray bottle until it became damp. We applied Licelogic Clear & Free Lice Treatment Shampoo and massaged it into her hair and on her scalp for 15 minutes. We made sure the product made contact with our girl’s entire hair and scalp. We rinsed it off with warm water afterwards. After the natural shampoo treatment there were no living lice left on her head. We wet-combed our girl’s hair, strand by strand, with Nit Free Terminator Lice Comb. It took us a lot of time and patience to comb all her hair, but it was very effective. You can also use the comb directly on Licelogic shampoo to comb out dead lice and nits. The shampoo can be loosen with water as needed. The following morning, we sprayed our daughter’s hair with LiceLogic Hair Nit Spray and we combed her hair with the fine-toothed comb once again. At the same time, we washed all our clothes, bed sheets, stuffed toys etc. and sprayed our household items with our household lice spray to get rid of lice and nits on surfaces. Me and my husband also checked each other’s scalp and hair and we were lucky to find out we were clean. Until the end of the day, we combed our girl’s hair several times to make sure her hair was nits free. Cartoons and children songs helped as a lot, given the fact that toddlers get bored quickly and don’t like to stay in place for a long time. In the evening, we washed her hair with her regular shampoo: Little Sleepy Head Gentle Baby Shampoo and Body Wash and let it dry naturally. During the next days, we applied Fairy Tales Rosemary Repel Conditioninig Spray on our daughter’s hair for prevention – in the morning, before daycare . As a conclusion, when dealing with lice, we warmly recommend you leave the embarrassment aside, talk to your pediatrician or pharmacist and choose the best treatment for your toddler. How was your first experience with lice? What products would you recommend?